Product placement is such big business that it has become an industry of its own, with around $14 billion being paid to shoehorn real-world brands into the fictional worlds we see on screen. The answer? Put the ads in places where viewers can’t skip them. As a result of the above, TV shows still account for 71.% of the product placement market, but some of the best – and most blatant – examples of product placement have come from the big screen. With this in mind, the New York Film Academy‘s film school department in Los Angeles decided to put together a list of some of the most expensive, ridiculous and less-than-subtle examples of product placements in movies. Turns out there was very little to worry about. When the movie was finally released, Heineken’s appearance – for which they paid $45,000,000 – was a blink-and-you’ll-miss-it affair. To help you spot it, we’ve timestamped the video above to the exact moment that Heineken sort of gets featured… with Bond’s hand obscuring the label. To rub salt (and a dash of lime) into the wound, another branded drink is portrayed prominently during the movie for seemingly no reason; Macallan’s whiskey didn’t pay a cent for the product placement, and weren’t even aware their tipple was going to be featured so heavily aside from granting a permission request to use the brand. Not bad going considering that the movie gave Macallan a whopping $9,000,000 worth of exposure value. All in all, around $200 million in product placement was accepted by the Skyfall production from the likes of Sony, Adidas, Heineken and the usual luxury car brands. Screen time aside, this wasn’t actually the first time Bond’s poison of choice has been swapped for an advertising partner’s, just the most outrage-causing. No list of notable examples of product placements in movies would be complete without mentioning Mac & Me. The movie doesn’t just feature heavy product placement. It is product placement. The entirety of Mac and Me – a painfully obvious rip-off of E.T: The Extra Terrestrial and strong contender for one of the worst movies ever made – runs like one tediously long commercial for Coca-Cola and McDonalds. It would be far easier to list the scenes in which either company’s products don’t appear than the scenes in which they do. … and don’t worry about the spoiler – we just saved you 90 minutes of your life. Mars – parent company behind M&Ms – was originally approached for an endorsement by E.T’s producers, but the confectionery overlords didn’t feel that the payoff would be worth it despite making the exact same mistake with Seinfeld. And a mistake is surely was. The offer of product placement was quickly snapped up by Hershey’s to promote their Reece’s Pieces instead, paying $1 million to have the candy featured in the movie and for permission to use the eponymous extra terrestrial in their own advertising campaigns. It was one of the earliest large-scale (and successful) examples of product placement in cinema history. Hershey’s saw an immediate 65% jump in profits thanks to the blockbuster’s success, and some marketer at Mars probably got fired. I, Robot is famous for its over-the-top product placement sprinkled liberally throughout the movie from brands like Audi, FedEx and JVC, but it was the outrageously unsubtle (and repeated) references to Will Smith’s ‘vintage’ Converse All-Stars that stuck in most viewers’ minds. Check out the video above, and you’ll see what I mean. I, Robot also achieved something of a first in product placement history. As far as we know (feel free to correct us in the comments below), it was the first movie in which a car was specifically designed for product placement within a movie: the Audi RSQ concept car was made with I, Robot in mind, and according to Audi AG, the project was a success in terms of raising positive brand awareness. Michael Bay has always been prone to accepting any product placement revenue that comes his way. Someone’s got to fund all those CGI explosions, right? … except for the product mentions that jarred even more as the movie went on. Resulting from trying to appease Chinese advertisers, much confusion was caused for American audiences in scenes where characters – supposedly in Texas – drank things like Shuhua and Yili milk, Chinese protein products, and Chinese Red Bull. Construction Bank was also featured prominently, which didn’t make a lick of sense to anyone outside of China. Even the brands across the Pacific weren’t overly impressed with how it was handled, with some of the featured brands threatening lawsuits against Paramount for the shoddy handling. It’s little wonder that Transformers 4 is being billed as one of the worst examples of product placement in recent memory. The product placement of Taco Bell in Sly Stallone’s 1993 sci-fi action bonanza couldn’t be more obvious – it’s literally highlighted with neon signs – but that alone doesn’t make it a notable entry into this list. What’s interesting about the product placement here is that some people remember it as Taco Bell, while others remember it as Pizza Hut. The reason? Because Taco Bell isn’t known in all regions – particularly Europe – so this was changed in post production with some heavy overdubbing for release in those areas. We’ll let you watch the above comparison and decide whether or not they did a good job. … although technically, this famous example might not actually qualify as product placement since there’s no evidence to confirm whether or not any of the above-listed brands actually paid for these plugs, or whether it was simply done for comedic purposes. 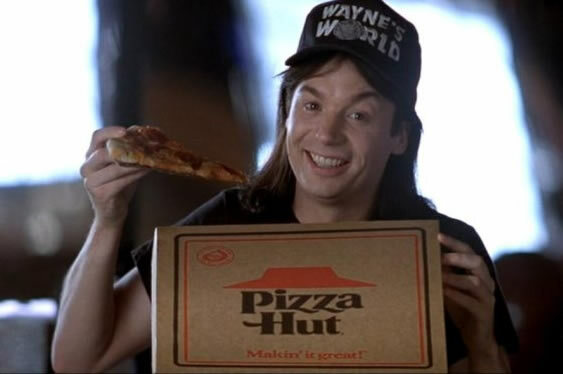 Know of any other shameless examples of product placement we might have missed? Head on down to the comments and let us know your favorite and/or most cringeworthy moments in movie advertising!